On Monday Octber 3 I visited Venue Cymru for a special screening of ‘Will Catlin and his Arcadia’ by Dymphna Darcy (who is also creating a film for Adain Avion in collaboration with Arts Disability Wales and Dawns i Bawb ). Catlin was a theatrical entrepreneur and owner of the Arcadia Theatre, which once stood on the site of Venue Cymru (the plane will nest directly on the prom in front of this very location). The film features an in depth interview with and indeed the screening was graced by the presence of his daughter Margot Catlin, grace being the operative word as Margot is one the most graceful (and tallest) septuagenarians that I have ever met. 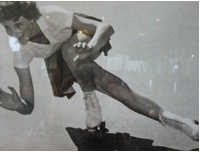 As a young girl Margot was a keen roller skater and her father built her a rink in front of the theatre. In later years Margot went on to join The Catlin Follies dance troupe that was based at the Arcadia. Following on from Cai Tomos’ emotionally charged performance contribution in National Theatre Wales’ ‘For Mountain, Sand & Sea’, which included the 80-year-old former cinema usherette Joanie Williams, I thought it would be perfect for Cai to continue exploring the reminiscences and distinct characteristics of an older person but this time the memories of Margot in motion. “I shall dance till the day I die” was the first thing that Margot said to us; Images of Moira Shearer in The Red Shoes immediately came to mind; she even has the same fiery red hair. “Margot has always danced; She said it is in her blood. At 76 her statuesque physical presence exudes her dancing history. Margot carries in her memories of dancing when she was younger. She has a “body” of experience. The premise of the project is to re-visit her memories of dancing through the body and in conversations with Margot, through a series of tasks over 6 months. The process of re-membering in itself is a great part of my interest in working with Margot. The piecing together of movement and the piecing together of memory. Cai and Margot have been meeting in the studio recently, and a beautiful, artistic relationship is starting to form – two people with over a century of dance experience between them and for whom dancing lies at the very core of their existence. They will continue to explore and develop movement material that will culminate in two solos, inside and outside the plane, in front of her father’s venue and on the exact location of her former skating haunt. A true site-specific experience for the maker the performer and the onlooker.